As science continues to study why we begin to lose our mental cognition as we age, the latest findings that our decline begins to worsen at the age of 45 is a wake up call to determine how we can best assist our body in reversing this trend. A human’s ability to remember data, to reason, and to understand things properly can begin to worsen at 45 years old (not at 60 years old, as previously believed). Mental reasoning among males aged 45-49 dropped by 3.6%, and 9.6% in the 65-70 age group. Among females, the decline was 3.6% for those aged 45-49, and 7.4% among those aged 65-70. This demonstrates the importance of promoting healthy lifestyles, particularly cardiovascular health, as there is emerging evidence that “what is good for our hearts is also good for our heads.” Risk factors linked to cognitive decline: hypertension, obesity and high cholesterol levels. Emerging research suggest that heart health is an important link to brain health. Our new and improved Cardio Advantage Plus for heart health now has lycopene – an herb clinically tested and shown to assist the body in lowering cholesterol, keeping arteries clean and host of other heart health benefits – a perfect addition to help our head (brain) and our hearts as we age. 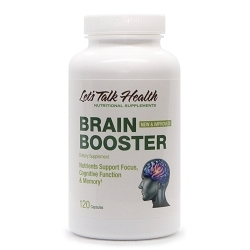 You may also want to explore our New and Improved Brain Booster Formula. Our brains need good nutrients, just like the rest of our body. In fact, it could be argued that good nutrition for the brain is vital to our quality of life as we age. Our proprietary blend of clinically proven natural nutrients works synergistically to create a formula that gets results. Many Let’s Talk Health Members report a difference within one week. The improvements include thinking more clearly with less distractions, much better short term memory and a marked reduction in senior moments where they can’t find their keys or remember the name of their neighbor. You will soon experience the benefits of proper brain nutrition – quicker thinking, better ability to focus and concentrate, and improved memory. Read our blog article: New & Improved Brain Booster to learn more about this new formulation.